Recognizing signs of illness in guinea pigs is sometimes tricky because these cuddly critters tend to conceal their symptoms. This can make it hard to spot invisible problems, like ear infections, before they become severe. Guinea pigs rarely get ear infections, but when they do, they are almost always caused by bacteria. If your piggy seems generally unwell or exhibits any symptoms of an ear infection, such as pain, discharge or trouble walking, take her to the vet right away. Waiting too long can cause permanent ear problems. Guinea pigs with an ear infection tend to walk with an unsteady gait or tilt their head to one side. If your pig is holding her head in an unusual position, see your vet right away. Delaying treatment can lead to permanent tilting or deafness. Some infections may also cause an odor in and around the affected ear, and some guineas may flinch or pull away when pressure is applied to the ear or the surrounding area. Sometimes, pus or discharge is noticeable. Minor infections may cause no symptoms. Severe infections may cause walking in circles, significant loss of balance or rolling on the ground. Bacterial ear infections require professional treatment with antibiotics. Most respond to topical antibiotic ear drops, but severe infections may require use of oral antibiotics. Monitor your guinea pig closely during treatment to ensure the infection is clearing, and report any side effects to your vet right away. Do not allow your pet to lick or groom areas contaminated by topical antibiotics. 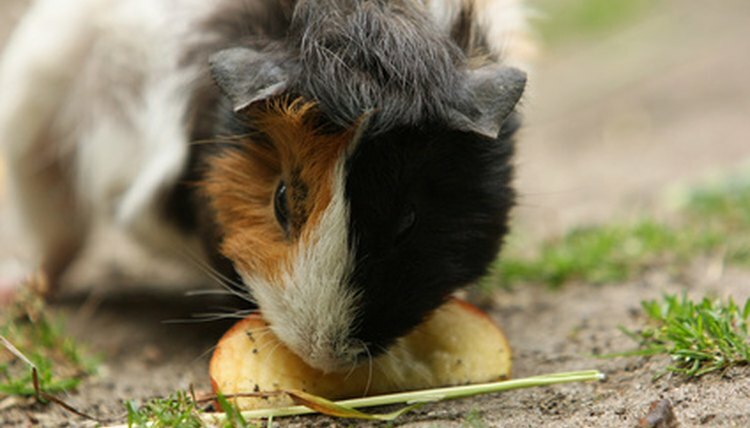 Cleaning your guinea pig's ears regularly will help treat and prevent bacterial infections. Additionally, using an ear cleanser to remove wax and debris before administering antibiotic drops will ensure the medication can fully penetrate for maximum effectiveness. Make sure your piggy is kept calm and in a stress-free environment and is eating and drinking regularly while recovering from an ear infection. Even a short time without water or food can seriously affect your pet's health. Consult your vet right away with any concerns. While less effective, topical antibiotics are preferable to oral antibiotics because guinea pigs are very sensitive to antibiotics and may develop severe side effects while taking them, according to The Merck Manual for Pet Health. Toxic effects to antibiotics may include reduced appetite, diarrhea, dehydration and low body temperature. These effects necessitate discontinuation of the medication and may be fatal in some cases. Never give your guinea pig antibiotics unless prescribed by your vet.